The Eameses were very precise about their clothes, commissioning them from Dorothy Jenkins, an Oscar-winning designer who did costumes for many films, including South Pacific, Night of the Iguana, and The Sound of Music. The effect of the Eameses’ costume was the professional couple as a matching set, carefully positioned like any other object in the layout. The uniform clothes transformed the couple into a designer object that could be moved around the frame or from picture to picture. It was always the layout that was the statement, not the objects. 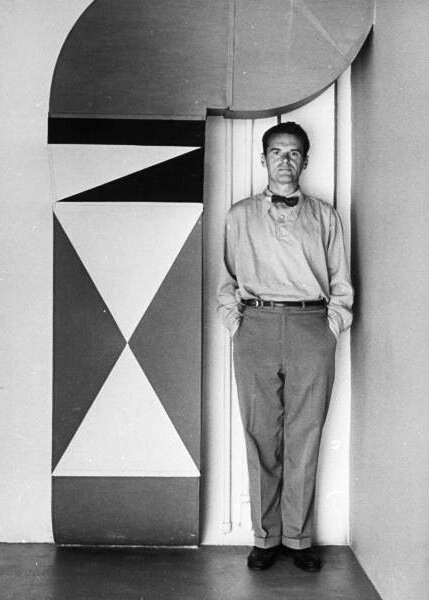 And the layout was constantly reworked, rearranged.” Beatriz Colomina, “Reflections on the Eames House,” The Work of Charles and Ray Eames: A Legacy of Invention. 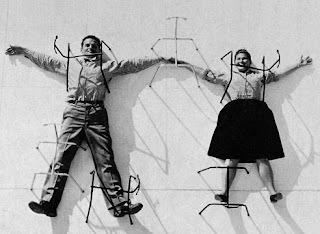 Ray Eames favored crisp white blouses, trim square-necked jumpers, waist-cropped jackets and dirndl skirts, a way of dressing which suited her and reflected her Austrian roots. 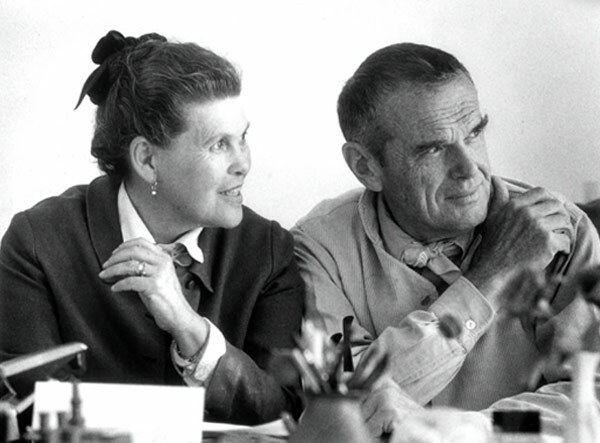 Much has been written about the couple’s many design collaborations such as the Eames lounge chair, the molded plywood chairs, and their house in the Pacific Palisades. Their clothing choices were no less distinctive. A PBS documentary in the American Masters series, Charles and Ray Eames: The Architect and the Painter, provides information on their clothing preferences. Talk about the ‘layout as statement’: the couple’s arms and legs mirror one another in the two top photos. Charles Eames and Oscar Wilde have a thing about buttons! I have an Eames chair, covered with a sort of salmon pink leather; I have wondered about the colors they select, prefer…any information you can add?